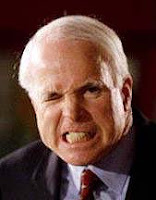 John W McCain, Republican Senator from Arizona, has officially entered the race for the presidency. His platform? Simple. If you like George W. Bush, you'll like him. His positions on the Iraq War, immigration, Hurricane Katrina, taxes, competence in government, and seperation of powers is identical. There is not a dime's worth of difference between the two. Maverick? Puh-lease! For McCain, that's so 20th century.